During the last thirty years, in situ measurements made in drill holes have been increasingly used for scientific applications in marine geology and geophysics, particularly in deep sea applications. Used mostly by the oil industry to map promising formations for exploration and production of hydrocarbons, a variety of instruments have been developed that can be lowered down drill holes to extract information about the subsurface geology. They are essential for measurements like temperature, for example, that must be made in situ. During the previous decade, this class of measurements using sophisticated electronic instruments has become common and is generally referred to as downhole "logging". With this technique, an instrument is lowered down a hole relatively soon after it is drilled and information taken from inside the hole is sent to the surface along a high-speed communications cable or "wireline". A major advantage of logging methods is that they collect data continuously over the depth drilled and with a minimum of disturbance to the natural system. Typically, logs made in a drill hole fall into three general categories: electrical, nuclear, and acoustic. The interested reader is referred to these publications for a more detailed technical discussion of logging instruments (Doveton , Ellis , and Goldberg ). Complete recovery of continuous log profiles, however, is not always possible with conventional wireline logging technology. The interval immediately below the seabed, and in particular, any sections of the hole that are unstable are not logged because the drill pipe must be lowered 80-100 m below the seafloor to insure hole stability in the softest sediments for logging to begin. 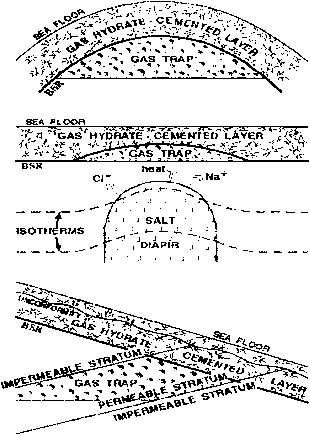 This is the typical case in deep sea hydrate environments. To benefit from the use of log data over the entire section, another approach must be taken.